In ancient Greece, tossing an apple to a girl was a traditional proposal of marriage; catching it was an indication of acceptance. A great low chill apple from Israel for our customer in Zones8-9. Anna has excellent quality with just enough tartness for fresh eating as well as cooking. A large red blushed apple that is a spur type so it will bear earlier in age and heavily. Ripens Late June. Zones 8-9. Crisp, juicy, very white flesh that is more coarser than fine. Beautiful glossy red with deep purplish streaks. It's characteristic conical shape tapers down to prominent bumps or chins at it's base. (This is the apple the witch gave to Snow White. Ripens Mid-Late September. Medium to large apple with dark red to sometimes black color with smooth waxy finish. Flesh is yellow and very firm with an aromatic flavor. Good storage life. Bears early in age. Ripens Mid-October. Zones 5-8. Super large greenish apple with a carmine blush. Crisp, slightly tart white flesh that's crunchy and bruise resistant. Ripens first part of October. Zones 5-8. A newer apple that is creating a lot of interest at the markets! The fruit are beautiful with a bright red striping over yellow. The great sweet-tart flavor seems to get better with age, so stores very well. Use for fresh eating, cooking, cider, and drying. Ripens in mid October. Zones 4-8. A favorite in England since 1830 as the classic dessert apple. The fruit has red and orange stripping with yellow flesh that is firm, sweet and very juicy. A parent to Gala. Great for fresh eating, pies and cider. Ripens early October. Zones 5-8. An old-time favorite for those who like a tart juicy apple. Great for fresh eating, cider, applesauce and drying. A medium size apple colored green with a red blushing. Ripens late July to early August. Medium size apple, cross between McIntosh and Delicious that produces solid red fruit that is sweet with slightly tart flavor. Fruit is firm, with an excellent storage life. Good for fresh eating, cider, sauce, cooking, and freezing. Ripens first of September. Zones 5-8. We now offer a very disease resistant apple that is late ripening to round out the season. This deep red medium to large apple has a spicy, tart flavor and is used for fresh eating, cooking sauce and freezing. The tree grows in a spreading form and is resistant to scab, cedar-apple rust, mildew and fire blight. Ripens mid October. Zones 4-9a. (Pollinator) Medium to large apple with a bright red blush on a yellow background. Flesh is cream colored, firm, juicy, and sprightly, similar to Stayman with a sweet-tart flavor. Highly disease resistant. Good pollinator. An exceedingly popular apple that sells out quickly at local apple houses. Medium size fruit have a red color over yellow striping. Flesh is firm and crunchy with a sweetness and acid flavor. Excellent storage life. Great for eating fresh & salads as well as for pies & sauce. Ripens mid Oct.
Gala's popularity is growing in the markets as more people try it and get hooked. The coloring is a mix of red, yellow and orange stripping. This wonderful summer apple has crisp flesh, which is juicy and sweet. Used for fresh eating and cooking, and stores well. Ripens early to late August. Zones 5-8. (Pollinator) Galarina is a new French variety that is a Gala cross with all the wonderful qualities of Gala yet with more disease resistance. The striped red fruit are crispy with a sweet flavor. They store well keeping their crispness and flavor for fresh eating, salads and cooking. The hardy tree has an upright-spreading habit, with pink fragrant blooms that start opening early and into mid-season. Ripens mid-late August. Zones 4-8. (Pollinator) Hold onto your hats! This chance seedling is from the orchard of Clyde and Ginger Harvey of Livingston, VA. When I met Mrs. Harvey at an apple meeting in Richmond, she told me that it was the perfect southern apple named for the perfect southern lady. Well, Mrs. Harvey is the perfect southern lady. The Ginger Gold out-distances the field in quality and flavor for fresh eating, cooking and keeping qualities. A must addition to anyone's orchard. Ripens late August to early September. Zones 5-9a. (Pollinator) Put off by the Goldens that you find in the supermarket? Ours are much crisper! This large yellow apple is your all-around apple. They are great for fresh eating, cooking, sauce, juice and cider. Ripens mid-late September. Zones 5-9a. 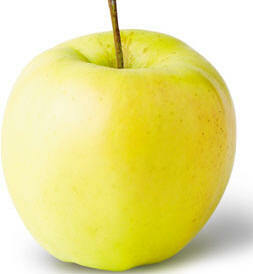 (Pollinator) Medium-large yellow apple that has been known to keep well in storage for up to 11 months! Crisp and sweet yet also resists browning when cut, making a very yellow applesauce. Great for fresh, sauce, freezing and baking. Resistant to fire blight and scab. Ripens mid October. Zones 6-8. (Pollinator) Medium to large green apple with white specks. A popular late variety. Flesh is creamy white with a distinctive tart flavor. Excellent for fresh eating, juice and pies. Ripens late October. Zones 5-9a. (Pollinator) This is an old favorite. Similar to a Golden Russet, it is suitable for fresh eating, cider, and cooking. Medium in size, the fruit is golden with russetting and crisp juicy flesh. Ripens mid October. Zones 5-8. A University of Tennessee introduction, this variety is hardy and productive even with fluctuating winter and spring temperatures. Disease resistance is good and the tree is forgiving of pruning errors. The apple is medium sized with a mostly red color. The flesh is crisp, and juicy with a mostly sweet flavor. Used as an all purpose apple. Excellent storage qualities. Ripens early mid October. Under trail in all zones. Developed at the Univ. of Minnesota, this variety is developing quite a following. It is mostly red over yellow color, with an aromatic sweet flavor. The flesh is crunchy, juicy and holds its texture for good storage. Used for fresh eating, cooking and cider. The tree is an annual bearer with good winter hardiness. Ripens mid Sept. Zones 4-7. This is the old-timey favorite that everybody wants to keep around. It has some disease resistance and has been found at many old home places. Grows a large yellowish apple that is great for fresh eating, pies and cooking. Ripens early August. Zones 5-8. A complete guide to growing fruit trees in the home garden. 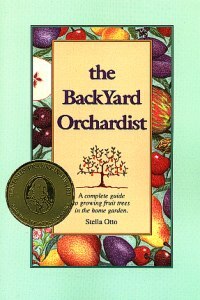 An orchard owner, horticulture instructor, and consultant, Ms. Otto has frequently faced the questions presented in The Backyard Orchardist. Written with simple and logical steps for the beginner, yet with in-depth explanations for the experienced grower. One of the leading apples in Belgium, this large apple has an attractive red blush over yellow. A very sweet apple with outstanding dessert qualities. Being a triploid, it cannot pollinate other varieties. Ripens late September. Zones 5-8. A large greenish apple with red blush. The tree was found in Farish Waddell's old orchard in Ellijay. The tree has produced apples the size of softballs and bigger, some weighing up to 2 lbs. Has a sprightly, semi-tart flavor, excellent for fresh eating, cooking, freezing, or drying. Good storage quality. Ripens mid-September. For trial in all zones. Thought to be a cross of Jonathan X Ark. Black or Jonathan X Winesap, it was discovered in 1893 in Arkansas. This variety is a late bloomer and is disease resistant to scab and cedar-apple rust. The color can be red striped over green to almost red. The fruit is crisp and juicy with a sub-acid flavor. Good for fresh eating, cider and cooking. Ripens late October and hangs on into winter. (Pollinator) One of our more disease resistant apples, producing medium size, bright red fruit. Flesh is bright white, with semi-tart flavor. Excellent for fresh eating, cider, sauce, or freezing. Ripens first of September. Zones 4-7. Dating back to the 1700's, Limbertwig has many varieties in the family and was widely planted. It has a rough skin, greenish-yellow with a red blush. An excellent winter keeper great for fresh eating, pies, jellies, apple butter and cider. Ripens in October. Zones 5-8. A very disease resistant tree, it is thought to have its origins around 1833. This large red apple is great for fresh eating, cooking and cider. It has great keeping qualities and is said to achieve its peak flavor 2-3 months after picking. Flesh is firm, juicy, and mildly sub acid to tart. Ripens late October to November. Zones possibly 5-8. A good choice for heat and humidity tolerance in the south with some disease resistance. This is not a Delicious or Red Delicious strain of apple. The fruit is large with a pinkish red color. The flesh has a very distinctive flavor, crisp and juicy. Keeps well in the refrigerator - which is unusual for a summer apple. Use for fresh eating and cooking. Ripens mid to late August. Zones 6-9. Always a sell-out at apple houses, Mutsu is a very large greenish-yellow apple with firm, sweet-tart flesh. Storage life is excellent. Does not shrivel. Good for fresh eating, cooking, or cider. Sterile pollen - will not pollinate others. Ripens mid-late September. Zones 5-9a. Attractive pink blush over yellow on a medium to large apple. A Golden Delicious x Lady Williams cross, the crispness and sweet-tart flavor keeps well in storage and actually is best after 4 weeks. Flesh resists browning when cut so it is great for fresh eating, salads, cooking and baking. Ripens in late October. Tolerates summer heat well. A low chill variety needing only 400 chill hours. Zones 7-9. This disease-resistant apple is one of the earliest to ripen. A smooth glossy yellow skin holds sweet smooth flesh. Resistant to scab, mildew and moderately to fire blight. Ripens mid-late July. Zones 5-9a. This spur strain is like the very large classically shaped solid red fruit available in markets. The flesh is white, crisp, and sweet. Good for fresh eating and salads. Fruit are produced on spurs that bear at an earlier age and set heavy crops. Ripens mid to late September. (PP# 4322) An outstanding red summer apple that is russet-free with a red blush over yellow. This tree is disease resistant to scab, cedar-apple rust, fire blight and mildew. The medium-sized fruit is crisp and juicy with a sweet-tart flavor. Ripens late July to early August. Zones 5-9a. Large dark red apple that is highly self fertile. This late blooming variety is a dependable early bearer. Good for fresh eating, known for baking and applesauce. Ripens in late September. Zones 5-8. An old North Georgia apple that is one of the best for pies and preserves, as well as fresh eating. The skin is yellow flushed with brownish-red and streaked with pink. The crisp flesh is sweet and rich. Ripens late October. Zones possibly 5-8. This was one of Thomas Jefferson's favorites. Brilliant orange-red skin with crisp and juicy yellowish flesh that is high in vitamin C. The rich aromatic flavor makes it great for fresh eating, pies and cider. Great storage qualities. Ripens in Mid Sept. to mid Oct. Zones 5-8. Actually a seedling from a Winesap planted by Dr. J. Stayman in Kansas, this is an old standard variety for all uses - fresh eating, cooking, cider, sauce, pies and drying. The medium size apple is light green with pinkish-red stripes. Flesh is firm and juicy with a rich tart flavor great for fresh eating, cooking, baking and cider. Sterile pollen - will not pollinator others. Ripens early to mid-October. Zones 5-8. What more can you ask for? Great flavor and disease resistance! 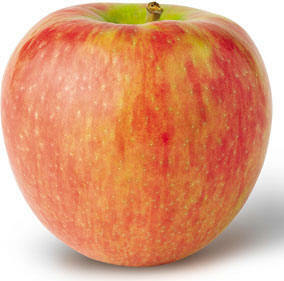 This large red striped apple has excellent dessert quality with crisp, juicy, sweet-tart and slightly spicy flavor. Keeps well. This semi-spur tree is resistant to apple scab, cedar-apple rust, fire blight and powdery mildew. Ripens early August. Zones 4-8. (Pollinator) Small juicy red apple with some red coloring in the white flesh. Fruit has its best flavor after the first good frost. This easy to grow variety is a favorite with wildlife and is a good pollinator for other varieties. Ripens October. An old variety prized for pies, fresh eating, ciders, jellies, sauce, cooking, freezing and drying. The greenish yellow apple is crisp with an excellent flavor - tart but sweeter than a Granny Smith. A late blooming tree that is self pollinating (rare) and vigorous. Ripens late Oct. Zones 5-8a. Crabapple trees are great for the fruit they produce, as well as being superb pollinators for apples. Wildlife enthusiast will find them to suit their needs also. Care for them the same way you do apple trees. (Pollinator) This variety comes from Callaway Gardens in Pine Mountain, GA. The 1.5" red fruit have yellow flesh that is crisp and mildly tart. Great for eating and jellies. Ripens late August and holds on into winter. (Pollinator) (Pollinator) These bright red 2" fruit are full of pectin so it is known for the ruby red jelly that it makes. Tree is very hardy and productive. It's reddish-green foliage makes it quite ornamental also. Ripens late August. Zones 5-9a. (Pollinator) Whitney is a great pollinator for apples as well as other crabapples. The 1½" fruit are yellow striped with red, and good for fresh eating as well as for making a great amber jelly. Ripens early Sept. and holds on into winter. Zones 5-8. Our specialty, apples are the all around favorite fruit of Americans that are nutritious, low in calories, and delicious at any meal or as a snack. Apple trees require full sun, well drained and moderately fertile soil. As a rule, apples need cross pollinating with another variety to ensure a good crop set. Some varieties are noted as a Pollinator because of their quality pollen and their long bloom period, and should be included within every orchard, at least one per four other trees. Dwarf Trees (Ht: 8-10 ft.) have the advantage of easier pruning, spraying, and picking. They also take up less room and produce apples earlier in age, but they do need to be supported with a trellis system or stakes. Recommended spacing for dwarf trees is minimum of 8-10 ft. apart. Semi-Dwarf Trees (Ht: 15-18 ft.) are free standing, produce a higher volume of fruit, and tolerate a wider range of soils. Recommended spacing is a minimum of 15 ft. apart.